JackQuest: The Tale of the Sword - Available now! Jack Quest: Tale of the Sword is a fast-paced 2D platform adventure game that serves up plenty of everything that makes the genre fun: a simple story involving a hero with an oversized sword, his kidnapped love, and a mighty boss monster with a vast subterranean lair seething with enemies. To this classic recipe, Jack Quest adds a sassy aggro warrior spirit entrapped in that big sword, plus a long waggly red scarf, and some cool parkour-like physics to make a very entertaining game. Jack and Nara enjoying their time together. Jack Quest: Tale of the Sword opens with Jack sharing a quiet moment with his childhood sweetheart Nara, about to confess his love for her. Suddenly she is seized by the incredibly powerful Korg, a giant evil Orc. As Korg and Nara disappear into the earth, Jack dives after them unarmed but determined to rescue his true love. Seconds later Jack stumbles upon Kuro, a noble spirit trapped in a massive but nimble sword. The two form an impromptu alliance and Jack Quest is off and running. One thing about Jack Quest that appeals to me is how it respects the genre, hewing to a design whose ancestry goes all the way back to, 80s arcade, and early console games like Metroid and Castlevania (Metroidvania). Jack Quest: Tale of the Sword incorporates many classic 2D-platformer themes, like picking up dropped red flasks for health, smashing wooden crates ejecting bouncing gold coins, and purchasing items from a shop (that somehow stays in business underground, surrounded by monsters). Jack’s special attack is a spinning-wheel sword move that deals rapid damage, plus the attack multiplier while protecting Jack from harm. The rewards and upgrades Jack finds and earns for defeating bosses, like double-jump boots, a map crystal, or a bow and arrow, are both satisfying and useful, enticing you to play on to the next level, and keeping gameplay fresh. Jack using his special attack against the slime boss. I think part of the attraction that keeps designers and gamers coming back to this classic format is the way these games constantly introduce new challenges as fast as the player wants to leap and battle through the map: new areas with different traps and tricks, new enemies and mini-bosses with new strategies, and new secrets to discover. Jack Quest definitely delivers in this department. I certainly never got bored. A little frustrated, sure, but never bored. But any frustration is outweighed by the rush of finally nailing that seemingly-impossible jump sequence or boss fight, which always seems so easy *after* you’ve conquered it. 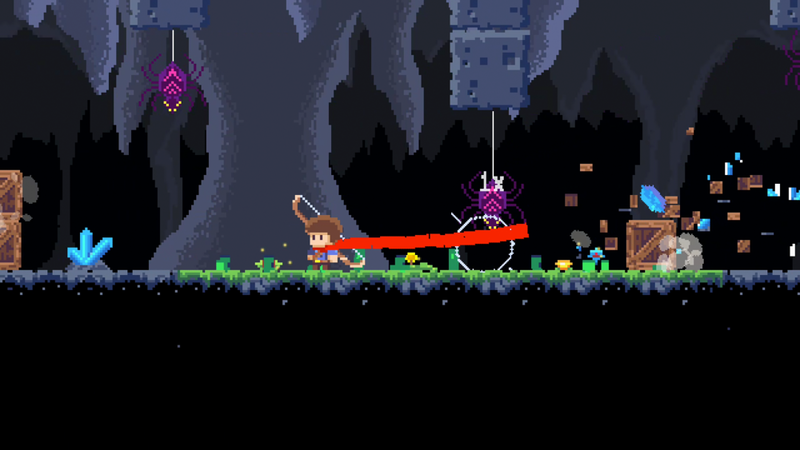 (“Why did this seem so difficult before?”) The thrill of improving your skill level to the point of overcoming these challenges is what metroidvania-type games are all about, and Jack Quest provides that thrill. The art design in Jack Quest has that nostalgic, pseudo-16-bit look that you see in many indie titles, but the game plays and feels perfectly modern. My first reaction to the art design was something like, “Hey this game is cute, maybe it’s aimed at a younger audience.” Then I started playing, and that opinion went out the window. Jack Quest is both challenging and rewarding, and can get surprisingly intense, often demanding precision timing to make it through some tough areas. I’m sure young kids will enjoy playing Jack Quest because the basic gameplay is simple enough, but kids are definitely not the sole intended audience. There is plenty of skill required to progress very far in this game. And the more you play, the more you get the feeling the maps were designed with an eye toward speed running, making the game very replayable. JackQuest has been carefully crafted to be both challenging and rewarding. While researching the game for this article, I was surprised to learn Jack Quest was entirely designed and created by one man: José Neto, founder and sole employee of NetoX studios in João Pessoa, on the eastern tip of Brazil. He designed the art, composed some music, made all the gameplay decisions, and did all the coding for Jack Quest. I asked José about Jack Quest’s classic look and feel, and he said it comes from his lifelong fondness for video games that began when he was a youngster, playing games on many platforms during the golden age of gaming consoles in the 1980s, including the Atari 2600, Magnavox Odyssey, and most importantly, the Sony MSX. The MSX system was very successful in Brazil in the 80s, and it included a full keyboard that allowed users to create and play games by typing code directly into the system. Back then gaming magazines often published the Basic code for entire games, and José’s creativity and passion for games were strong enough to drive him to read it from the magazine and type it in line by line. Eventually, he started creating his own small games, and his skills earned him a job at a software development company, and he continues to create games on his own time. So José Neto gets all the credit for this game being fun. Mr. Neto sneaked plenty of secrets and surprises into Jack Quest, like invisible doors and hidden rooms concealing rewards. But my favorite discovery in the game is the parkour-like wall-jump Jack can do to scale walls. Just mash the jump button while moving against a vertical wall and you can scramble right up it. There is a slight learning curve to get the timing right, but figuring it out is satisfying and encouraging. The wall-jump ability makes the gameplay and map navigation more fluid and smooth. And it creates this fun sense of freedom-of-motion as you rattle around Korg’s spacious digs. Jack using the wall-jump to fight his enemies. Jack Quest has lots of little touches that add depth and character to the game, like the wall-jump, as well as the hit multiplier that pops up when you land repeated strikes against an enemy. There are magic torches you can seek out that let you save anywhere, anytime, instead of only at waypoint stones. And Jack Quest has this very useful “ledge peek” feature: stand close to the edge of a drop-off to move the camera down and preview what’s just below the bottom edge of the screen. Could be safe to jump down, could be patrolled by enemies, could be spikes … ledge peek lets you look before you leap. Overall I found Jack Quest: Tale of the Sword to be an immensely satisfying 2D platformer, with loads of new challenges and surprises around every well-designed corner. It all comes together wonderfully: the art, the music, the action, the level design. The fact that the entire project was created by one dedicated game developer only makes this fun and engaging game even more impressive.